I’ve mentioned before that Christmas Eve is a big tradition for Italians. In many ways Christmas Eve was more important that Christmas growing up. For one thing, we opened up all of our gifts on Christmas eve. My brother and I were the first grandchildren on my Father’s side of the family – and we were for a few years until our other cousins came along. So on Christmas Eve Nick and I would have to stay up until midnight before we could open our presents i.e. we would be falling asleep on our Nonna’s couch. ‘Santa’ a.k.a my Nonno or Zio would dress up as Santa and come to my Nonna’s house at midnight to deliver presents. Earlier in the evening we would eat our Feast of Seven Fishes dinner – Italians do not eat meat on Christmas Eve, only seafood. My brother and I were incredibly lucky to grow up with such amazing food and traditions. It was truly a feast to remember. We would begin with a seafood pasta course (usually tuna sauce my dad or nonna would make), followed by fish, prawns, mussels, clams, baccalà (salted cod), homemade calamari and other amazing dishes. It has always been my favourite memory of Christmas with my dads family. As a child I remember stealing Pizzelles from the counter before dinner, when Nonna or Nonno weren’t looking. 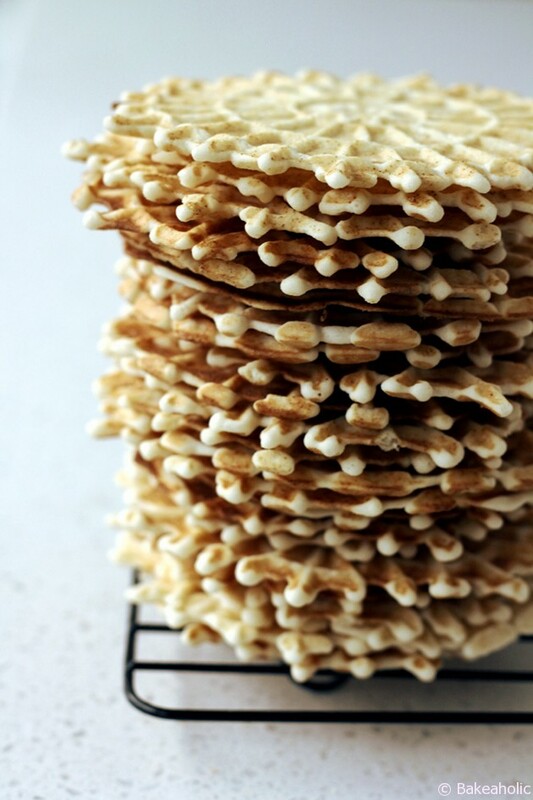 Pizzelles are incredibly thin, delicate waffle like cookies that are crisp and slightly sweet. You can eat about 6 in a minute flat. They were always the elusive holiday cookie that you would only get at Christmas or maybe Easter. Pizzelle makers were not popular so only my Nonna would have one therefore making it an even more treasured dessert that I looked forward to. Now, I have my very own Pizzelle maker by a complete mishap that happened this summer. Long story short, the company Chef’s Choice sent me an e-mail on a completely different subject that lead me to respond and receive a response from a woman in their marketing department. After a few back and forth conversations about her daughter, myself and my family she offered to send me one of their products to make up for the mishap. 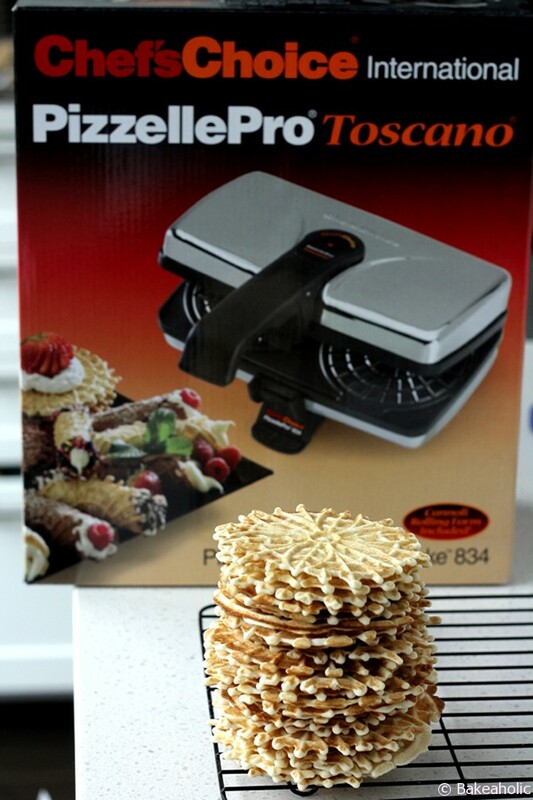 Of course I chose the Pizzelle maker, as it meant I would not longer have to borrow my Nonnas. 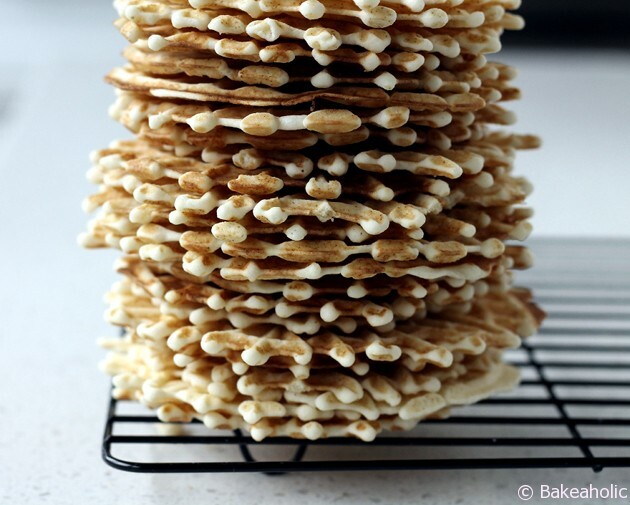 Also – that I could now make Pizzelle’s whenever I wanted. I am also excited to be hosting my very first Christmas Eve dinner at our house this year. In honour of my Dad I hope everything turns out – though Christmas Eve has never quite been the same since he passed. Christmas makes me feel incredibly nostalgic. Nevertheless I am looking forward to having all of my family over to share a delicious seafood meal together – and Pizzelle’s will definitely be on the dessert counter. This time, I won’t have to sneak them. 1. 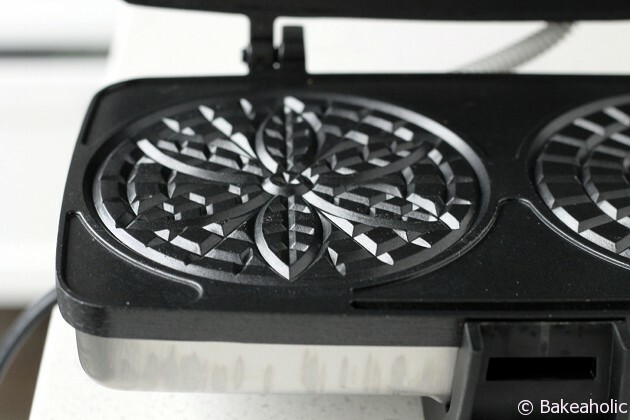 Turn on Pizzelle Maker. In a medium sized bowl beat together the eggs and sugar until frothy. 2. Add the cooled melted butter or oil, vanilla and anise seeds (optional) and beat again. 3. In small bowl, sift together the flour and baking powder. Add to the egg mixture stirring with wooden spoon. 4. Stir batter until well combined, it will be slightly stiff and dough-like. The dough should be stiff enough to drop by rounded spoonfuls. 5. Drop by spoonfuls in the centre of the Pizzelle maker. Be careful not to place too much dough, otherwise it will spill out over the sides. You want them to have delicate 'fingers' like lace. 6. 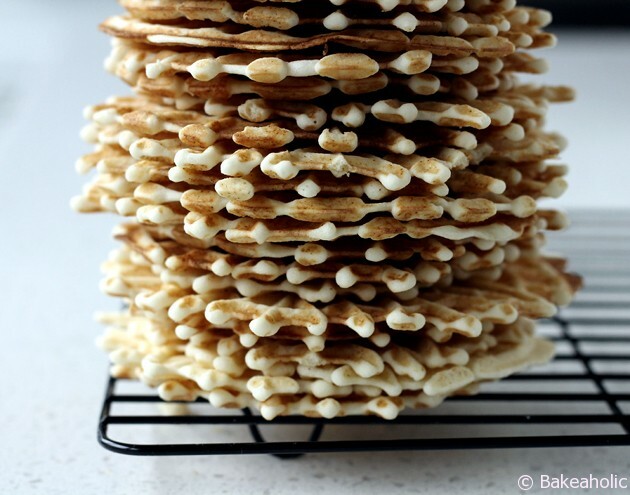 Bake according to your Pizzelle Maker's instructions, usually only 20-30 seconds per batch. Carefully lift off using a fork. Place on cooling rack to crisp. Pizzelle cookies last quite well. Place in airtight container (my nonna would always place paper towel over them) and store on counter for up to 2 weeks. You can also easily freeze them for ice cream sundaes, or ice cream sandwiches.